Photo: "luminato blue" by blogTO Flickr pooler Soluta. On Friday, a man intentionally drove his van into his daughter, her brother-in-law and her boyfriend - at their school. The boyfriend also happens to be the same kid who had his house firebombed back in April. Yikes. An 18-month old baby fell to his death from a 28th floor apartment, prompting questions about the safety of our city high-rises. Whether or not charges will be laid also remains a question. Ironically, a demonstration by Women Against Poverty Collective calling for affordable housing for abused women was broken up forcefully by police. Some protestors are claiming the use of force was excessive while the police insist that their conduct was appropriate. North York police response to a stolen car/gun call resulted in a car chase that ended in tragedy. The fleeing 15-year old driver crashed into a taxi, and neither he nor the two teenage girls who were passengers in the cab survived. Police are looking for two men involved in a shooting at Trinity Bellwoods Park last night. Two nudist resorts in the GTA are up for sale, citing lagging/sagging membership. Glen Echo and Four Seasons resorts are hoping that the new owners share the "naturist" way. 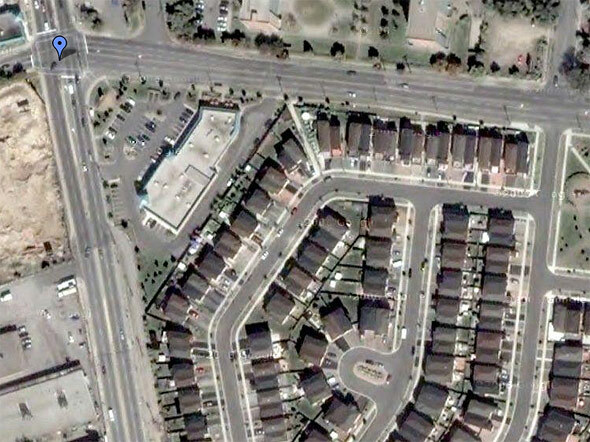 Friday's answer: Sussex Center, Mississauga.